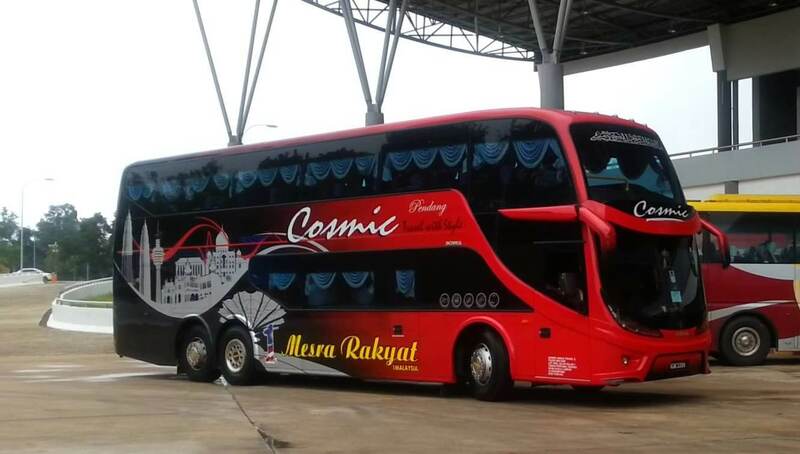 Cosmic Express is one of the familiar operators cruising across Peninsular Malaysia. With an arsenal of routes provided, Cosmic Express is one of the most versatile operators around. Among the many routes provided include, from Kuantan, Alor Setar, Kuala Perlis, Kuala Lumpur and more. They also operate at bus terminals within these parts as well. Their fully air-conditioned executive coaches are equipped with 38 reclining seats, each with ample legroom, making it suitable for long distance travels. Aside from that, there are also overhead compartments provided as well as power outlets for passengers to charge their electronic devices. Their staff are also friendly and accommodating, creating a pleasant travelling experience for fellow passengers. Executive class - 38 seater. Wide range of routes to various parts of Peninsular Malaysia. Operate at various bus terminals across Peninsular Malaysia. Reputable operator in the bus industry. CatchThatBus offers online bus tickets to many routes covered by Cosmic Express as well as seat availability features. You can book your bus ticket online from our website or via mobile app which can be downloaded for free on Google Play or App Store. Polite staff. Good driver. departed and arrive on time. power socket coming out and cannot switch off. fix please. journey is fine. departed and arrived on time. Smooth journey, comfortable seats. air cond not so cold. no complains. Customer service didnt answer on time. I miss my bus and no refund.